Dowsing is a fascinating subject which purports to date back some 7000 years, although its actual origins are not known. In the ancient artwork of the Egyptians there is evidence of forked rods being employed, likewise in China. In the Middle Ages dowsing was used to locate coal deposits on the Continent. Water Diviners, using rods made with either copper, forked Hazel, Apple, Beech or Alder branches, today work in many parts of the country and their accuracy in finding underground springs is legendary. And it is surprising how many mining and oil corporations employ the skills of dowsers in exploration work. What is Dowsing and How Does it Work? Many people have attempted to answer these questions, but the simple fact is that there is no straightforward explanation. It appears to be an inherent ability in man to connect with Universal energy enabling him to be guided towards very accurate answers to the question(s) raised. Almost all dowsing is used when looking for something or when seeking answers to specific questions. In addition to the searches referred to above, dowsing is used to trace lost articles missing people or animals, as an aid to diagnosis - in both people and animals - and to select the correct remedies, to trace geopathic stress in houses or buildings where its influence adversely affects existing health problems or causes new ones such as insomnia or depression, to gain guidance to problems or simply to help make a decision or choice. 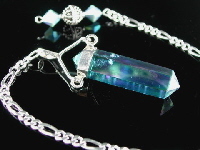 There are a variety of dowsing tools, Angle rods, V-rods, Double VV-rods, Wands and Pendulums. Although rods are still in use, it is common today to find people using a pendulum – or dowser, whichever you prefer to call it. These may be made of metal, wood, semi-precious stones, crystal, or even a button or wedding ring suspended on a length of thread. Choosing Your Pendulum Anyone can dowse. Here are a few tips to help you on your way. Take time to choose the type of pendulum with which you will be working. When choosing one made from semi-precious stones or crystal, spend some time becoming acquainted with its energy. Handle it, get used to the feel of its swing and above all, respect it. Keep it in a pouch when not in use, and, having used it, always cleanse it before putting it away. For yourself, learn to empty your mind of any thoughts, learn to control your brain and senses to allow the answers to come through naturally without conscious input or influence. This may call for a little patience on your part, but with practice it will become second nature to move into that still space where your concentration is undisturbed and your mind completely at ease, ready to receive the information being sought. If, despite patience and practice you feel you still cannot completely stop unwanted thoughts or any of the senses intruding do not despair. This is the most common problem when starting out and it can happen to skilled dowsers on occasion. The answer is not to give up. Carry on practising but try not to do so when you are tired or have had a stressful day. Take time to rest or unwind. It is harder to clear your head when you are stressed and tiredness dulls all our responses. Once you have achieved the knack of emptying your mind and controlling your senses you will find that it comes very naturally. Possible responses to these questions are rotating clockwise or anti-clockwise, swinging from side to side, backwards and forwards, or diagonally. One thing to remember is that should you have more than one pendulum you must determine these responses for each one. The fact that one pendulum behaves in one way does not mean that this applies to all the pendulums you use – each has its own individual responses depending on the pendulum material and its interaction with your energy. Asking and Phrasing Questions When asking questions, be very specific about what it is you wish to know. For example, suppose you have mislaid your reading glasses and you ask your pendulum ‘Did I leave my glasses in the car?’ You might well get a positive response, only to find that the glasses in the car are your sunglasses, not the ones you are actually looking for. So in these circumstances it would be better to ask ‘Did I leave my reading glasses in the car?’ A simple alteration to the question, but necessary to achieve the correct answer. As a beginner, practice dowsing on things which can be checked – ‘Is our garden 100 - 120 yards long?’ If the answer is No, ask again ‘Is our garden between 50 and 100 yards long?’ Continue asking specific lengths until you get a positive response, then go and check. If on any occasion you are unable to get a specific response to a question, and you are certain you have phrased it correctly, do not keep trying. Sometimes we are not meant to know at the time of asking. If the matter can be left until the next day, ask again then. If at this attempt you do not get a response, accept that whatever the question relates to has yet to be resolved. Leave it and if in the meantime the situation has not changed, ask again a few days later. A pendulum is a very special working tool which can be used for myriad purposes. Be patient, practice to enhance your innate sensitivity, be confident that dowsing works for you, never abuse your ability by ‘showing off’ and always use the skills you are developing for the greater good of all. Dowsing is not about analysis and reason – it is a gift we all have and those who chose to use it will not only find it extremely helpful for themselves and others, they will also become one of a long line of dowsers, continuing a skill which can be traced back to our distant ancestors. How much more fulfilling can that be?